Nurse, Author and Artist- Meet Miranda Fix, my awesome, talented friend! Again, I am so Blessed to be surrounded by awesome, talented women and my featured guest this month is someone near and dear to my heart because of her big heart. Miranda, or “Linda” as she likes to be called, is an RN with a passion for caring and giving back. When she agreed to be featured on my Blog, I sent her a series of questions hoping to receive a sentence or two for each question but instead Linda did all my work for me and wrote the blog story herself! Re- telling her story of Natalie and the Angel may bring a tear to your eye as it did to mine, but it will also warm your soul. 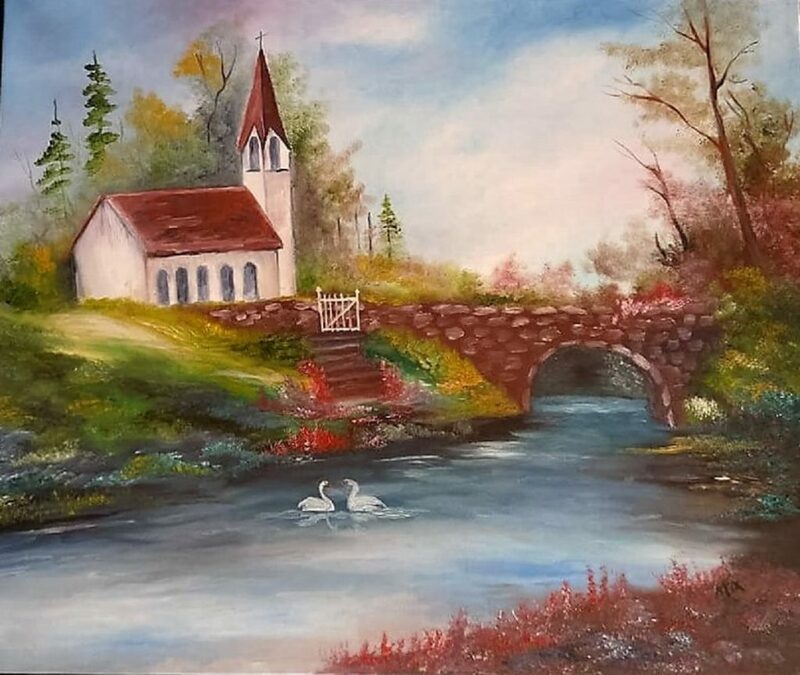 I just know you’re going to love her paintings and creativity, so, without further ado, please welcome my awesome, talented friend, Linda Fix! My name is Linda Miranda Fix and I live in Western New York; a rural area about twenty miles from Buffalo. I have lived in this area my entire life. (Which is kind of a long time, lol). What I love most about country living isn’t the peace and quiet; although I am sure that is what most people say. Our back yard has a train running through it several times a day and we live off a main road so there is plenty of road traffic flying by in our front yard. However, having said that, what I love most about country living is the chance to witness some of the most amazing wildlife moments. I love the beauty of springtime when Mother Nature is “pregnant” and the wonder of it all. I am a soon to retire Registered Nurse of forty one years. It seems hard to believe it’s been that long and I am amazed at how quickly time has sped away from me. I was a nurse before HIV, AIDS, superbugs and home care. I was a nurse when a cataract surgery meant the patient was hospitalized for five days and a c-section was ten days. We mixed many of our own medications and IV solutions…I have worked many specialties throughout the years of my career; pediatrics, geriatrics, home care, licensed and certified agencies, I taught a nursing program, worked in case management and insurance. I guess I wanted to try out as many new adventures as possible. I began my career in the Neonatal Intensive Care Unit at Children’s Hospital in Buffalo NY. I was only twenty one years old, and in charge of the evening shift. That is where I learned about miracles. Although I have remained in the nursing profession a fairly long time, there was really a passion I had for an entirely different career. Perhaps that’s the reason I had so many different positions and chose to pursue a variety of specialties. I am grateful for the career as a nurse, I took care of so many people I will never forget and they made me who I am today. But I was unsettled, and I knew something was missing. The passion I am referring to is the Arts. I love to paint, draw, create and write. My dad was an artist, although he never said he was. I think the definition of an artist is made to be rather complicated. For me, it’s simple. As soon as you create something you are proud of, you are an artist. I began drawing at a very early age; actually I would not color the pictures in my coloring books. I would find any paper I could and I would re-draw them, and then I would color them. Back then, it was hard to find paper, and we could not afford any art papers or canvas, so I colored and painted on cardboard, and several other surfaces I could find. I used colored pencils, crayons, and oil paint, as there wasn’t much option back then. 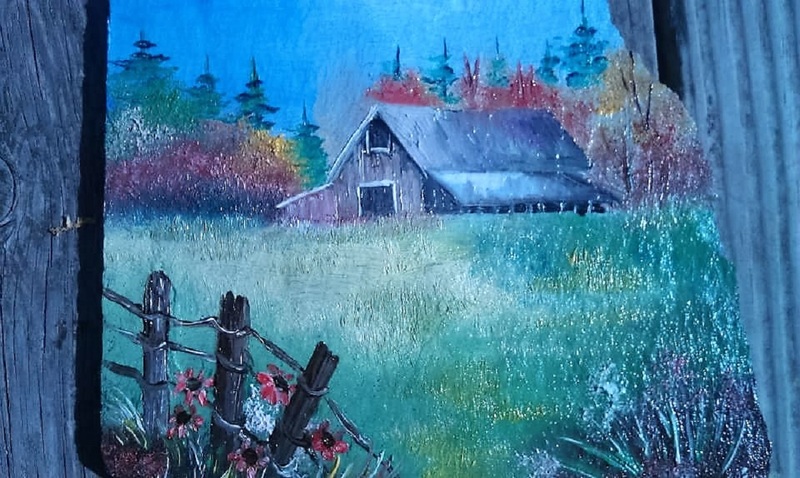 Acrylic paints were invented in the 50’s and was not easily available at that time. In high school I wanted to be an artist, not an art teacher, but a billboard painter (yes, that’s right, a billboard painter, lol). Well needless to say it was clearly not an option for a female dreamer in the early 70’s. I was encouraged to be a secretary or a nurse instead. The rest is history. So I packed away the art supplies, paint and brushes and did not reach for them again until twenty years later. They say that we should be open to life reviews as we journey through life, I am not sure if I understood that the year I turned forty, but I did understand that I felt like something was missing in my life. I wasn’t really “spiritually happy” and so I thought long and hard and recalled when I was happiest…it was when I created art and writing. So that is when I picked up a paint brush again. It was the year of Bob Ross; the kind man with his soft voice that helped me to start painting again. I started painting on canvas, and wood and ultimately, slate. I used oil as my primary medium, but since then I have enjoyed painting with acrylic, watercolor, prismacolor pencils and Copic markers. I have now been painting for over twenty years but it has only been in the last year that I have journeyed on to another level. I decided to become a certified art instructor and received my certification through Grumbacher and I also teach drawing at Michaels. 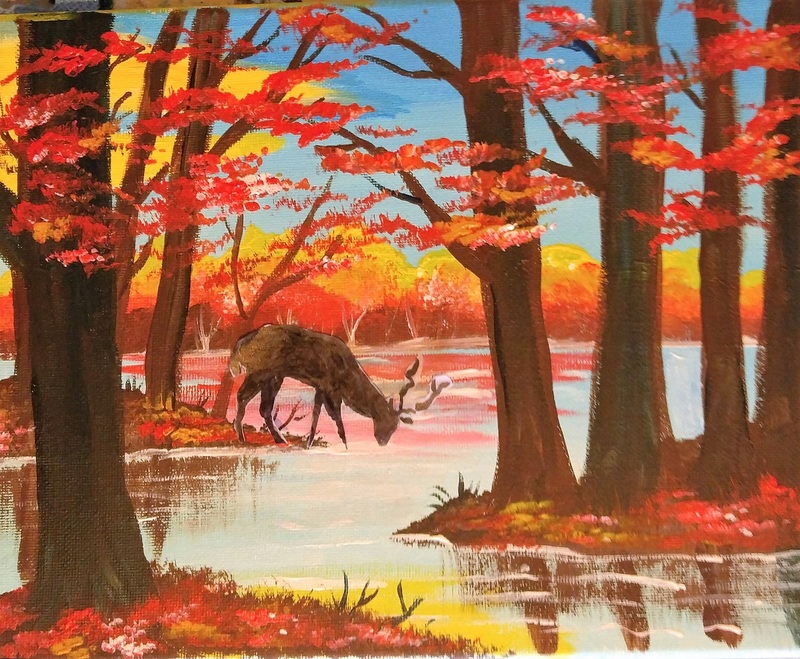 I teach Acrylic painting classes as well, once a week at a local shop in Aden (Alden Tanning and Wellness) and I also do home painting parties. I enjoy doing Art and craft shows as well as Art festivals. My artwork is usually in a local art gallery (Go ART) in Batavia, NY. Currently I have one piece in an art show there until January). I also sell my art and jewelry designs in several local stores. About a year and a half ago, I became restless with the landscape painting and wanted to try something different. My talented niece, Emily told me about Prismacolor pencils and I bought a set. What’s truly amazing is what happened next. I have never been able to paint portraits. Drawing and painting people is just not one of my strengths. Yet, I felt compelled to draw angels. I mentioned earlier that I believe in miracles. Well, there is a very good reason. It is a rather long story, but a three month old baby I was chosen to care for one very long midnight shift in the month of December, 1993 changed my life forever. I met Natalie in one of my newest jobs in a pediatric nursing home. I was working the night shift and when I came on duty, Natalie was already gravely ill. It was the year of the DNR; do not resuscitate. It wasn’t something that we truly understood so unfortunately nobody quite knew what to do. You see, Natalie had a DNR set into place. Her parents were encouraged to do so as Natalie had several anomalies along with severe developmental delays and profound retardation. As Natalie continued her downward spiral, I did everything a nurse could do to keep her alive. I was not given authorization to send her back to Children’s for treatment as I was aware; she was a DNR. There are several details to the story that night, but I guess the most significant and amazing part of it, is that Natalie survived. Every time she stopped breathing I suctioned her, and finally by morning, she began to show signs of improvement. Not just small signs. Her color turned a beautiful pink again, and she was breathing easy. I was amazed and I had been praying all night. I never left her side because my co-worker and nurse, Paul agreed to take care of all the other children if I would just care for Natalie. For the first time, I laid Natalie down in her crib and I walked over to the window. It was December 20, 1993 and the sunrise was breathtaking. I remember thinking how unusual that a cold winter day in Buffalo NY would have such a lovely sunrise. I suddenly felt gentle arms around me, mostly on my left shoulder. I was certain someone had entered the room and I had not noticed. When I turned around, there wasn’t anyone there and when I looked out at the sunrise again I felt a peace I cannot explain. A love I still cannot put into words. In my heart I believe it was an angel. I realized from that experience that angels are ever present in our lives and I have researched them ever since then. 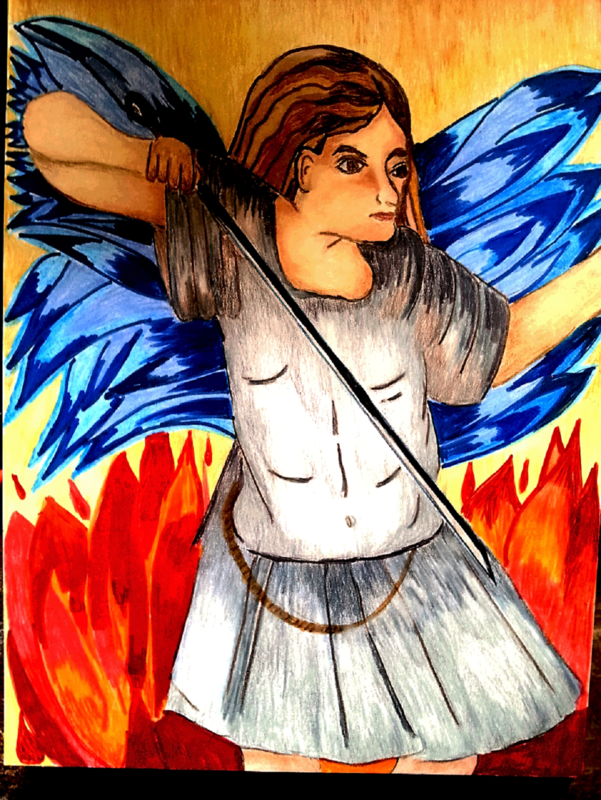 So, a little over a year ago I decided to just start drawing angels, from my heart and soul. 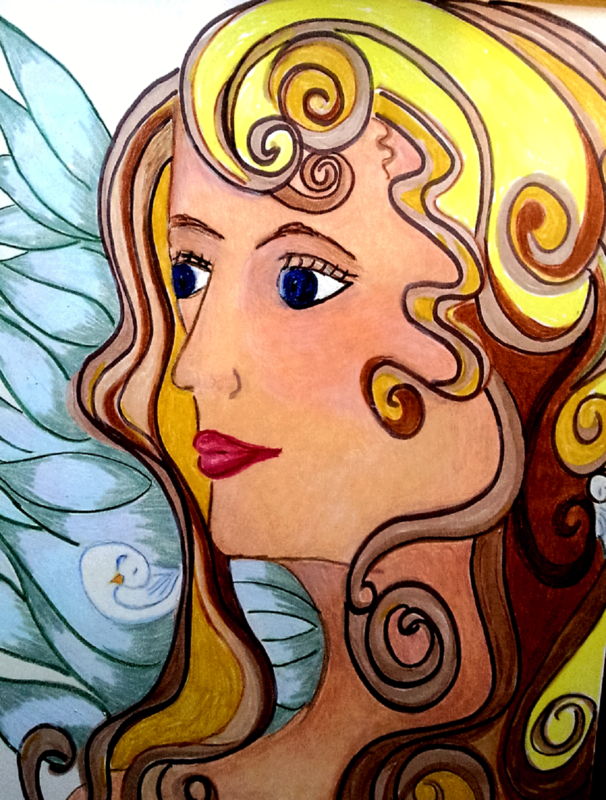 To this day, I continue to draw them and I also realized that each angel was meant to carry a special meaning, and therefore they are named, have spiritual messages and I sell them and the cards that I create. I currently have a shop on ETSY under Mirandasangels. It has been an amazing journey. Just like my passion for art, I also loved to write. I have written and published poetry since I was twelve years old and in 1998 wrote my first novel, “Beyond the Butterscotch Sun.” Since then, I have written six more. My novels are romantic mysteries and my last two novels have included “conspiracy theories”. “Alchemy’s Fraud” and “Hippocratic Fraud.” Which can be found on Amazon. Only one of my novels, “Calling All Angels” is written about my experiences as a Registered nurse, and of course as the title implies, my experiences with angels. So, what’s next for me? I applied for an artist grant for an online project called, Hartshare. They were looking for artists to join the team. Hartshare is a very unique concept that will be going live on November 1st of this year. 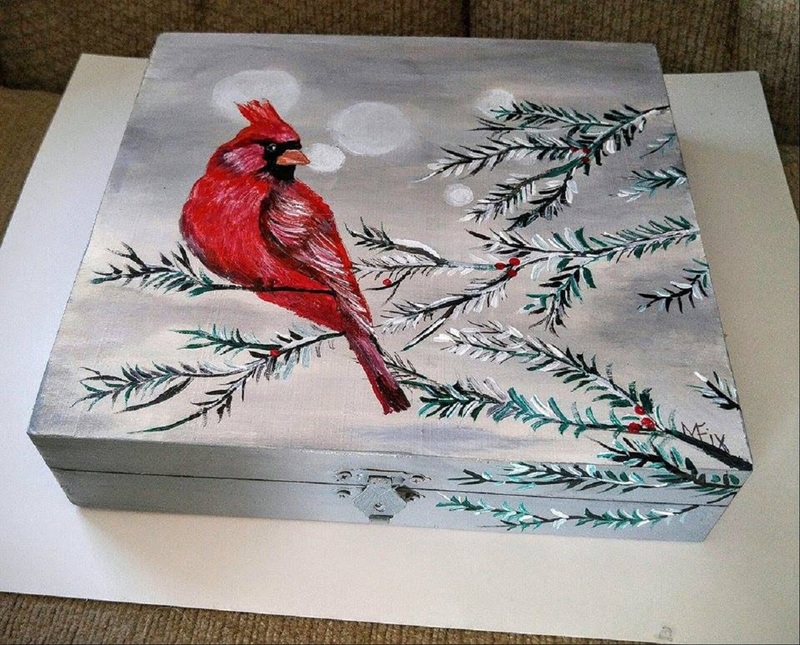 There were forty artists chosen to paint boxes. These boxes will be one of a kind hand painted. The customer will purchase the box and at that time it is issued a passport. The passport is affixed to the top of the box and it is numbered. The customer will insert that number online at the Hartshare website and register its purchase. Once the box is gifted, the recipient can keep what is inside the box, but they are requested to re-gift the box along with their story about why they were given the box. As this special box makes its journey every recipient of the box will enter the information into the website with their own unique story. The box will collect many stickers and badges along the way as it can potentially travel around the world. I am very excited and honored to be one of the artists chosen. Please check it out; this is the dream and idea of a very special lady by the name of Jani Bryson. There is currently a link on the facebook app to like her page, and once we go live, there will be a webpage. Thanks for reading my story, I am honored. Thank you dear friend, Karen, for asking me to share a piece of myself! Again, I am honored. I am so pleased that Linda agreed to share her awesome talent with us. 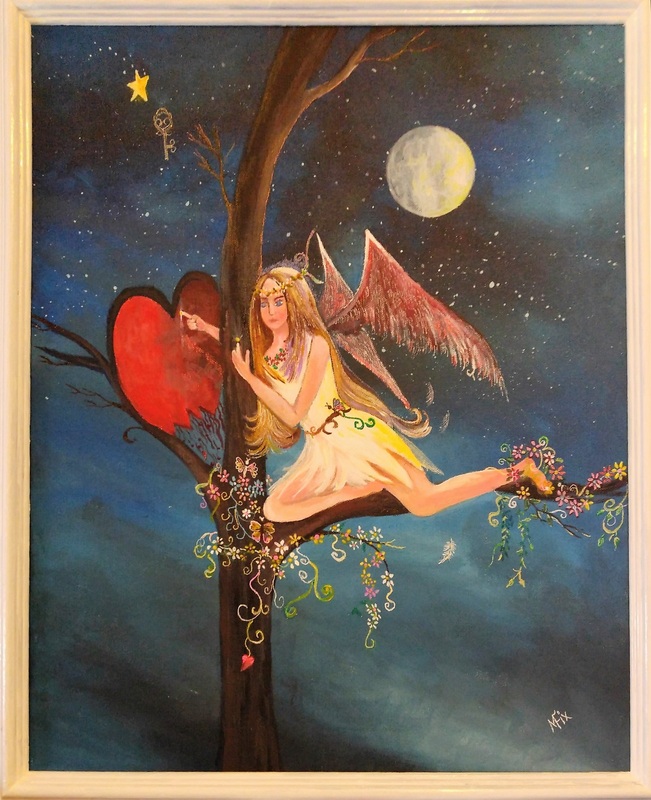 I hope you all have enjoyed reading her heartfelt story and seeing her beautiful art work depicting Angels and more. What I find so inspiring is that when Linda knew there was something missing in her life, she did not hesitate or let self doubt hold her back. And that is a lesson for all of us! Our journey on this earth is short and the years fly by. We all need to fulfill our hearts desire, no matter what that may be. Thanks for stopping by today. Wherever your journey leads today, I wish you strength to pursue whatever may be your passion. Hugs and much love from me. Follow me at: www.thejournygirl.com and be sure to leave me a comment. I love hearing from you all! « Kicked Up Chicken Tortilla Soup! I loved reading this about our dear friend Linda. I am proud to say we fondly call each other soul sisters too. Her talent is incredible and I am proud to say that I have several of her paintings in my home and I have given her artwork as gifts as well. I completely forgot that Linda made a painting on slate of our Alpacas for Dan! I will have to post a photo of it. Thanks again for commenting. We are truly blessed as friends. My daughter had a painting party at her house and Linda Miranda Fix was the instructor. When i arrived I became aware that we lived right up the street from each other as children and had hung out together. What a small world. I had not seen her in years!! Linda did a great job instructing us on how to paint and believe me when I tell you I can not draw a stick figure. I was amazed at how well my picture turned out. 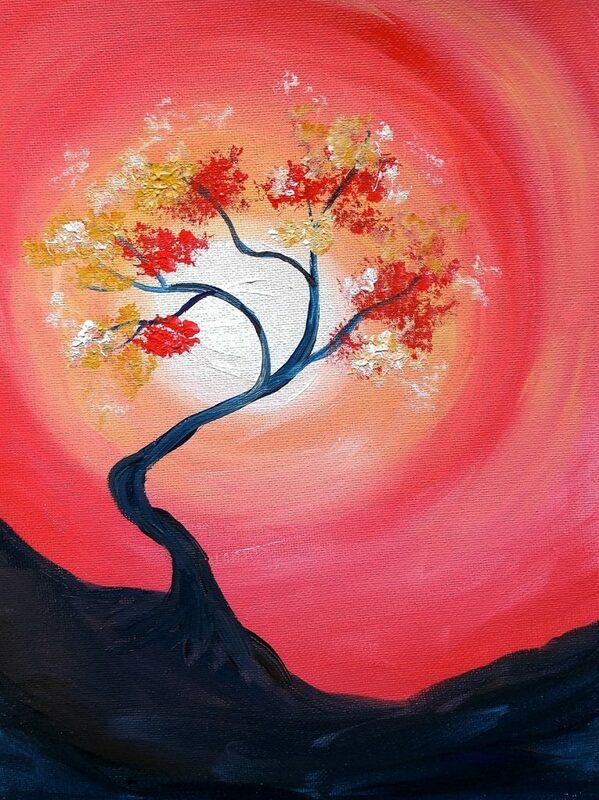 Linda made the night fun and she was very supportive in teaching us all how to paint. What a nice compliment for Linda! Thanks so much for taking the time to write. It means a lot for Linda and me.